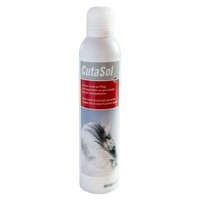 Derbymed CutaSol is a foam cream that will soothe itching and irritated skin caused by sweet itch, and help to relieve and repair any skin damage caused. Designed to build up a breathable, two-dimensional protection, CutaSol absorbs into the lipid layer of the dry skin and promote recovery of the skin barrier function. This helps to reduce itching and accelerate the healing process. Due to its unique texture the patented foam cream allows an easy and accurate application to the skin.